ST. GEORGE — An eight-car pileup caused by one driver running a red light at the intersection of River Road and St. George Boulevard Wednesday afternoon injured several drivers, two of whom were transported to the hospital. 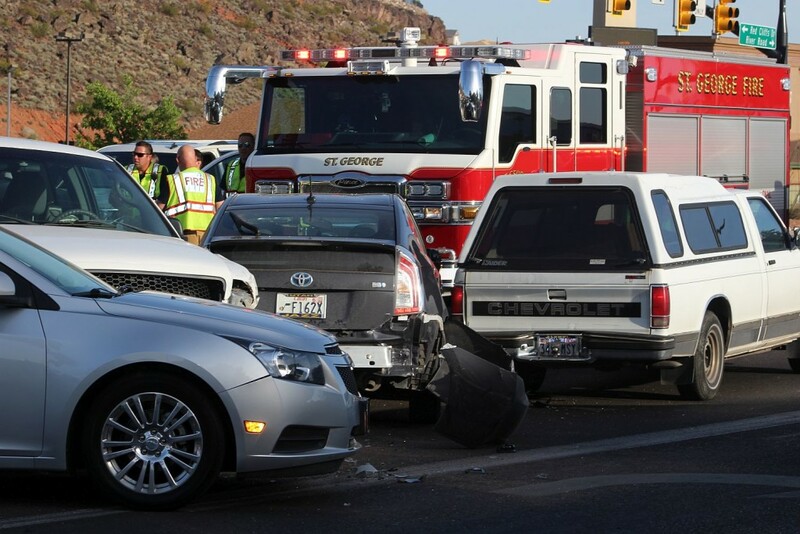 Just after 6 p.m., emergency personnel responded to a reported crash initially thought to involve six vehicles. 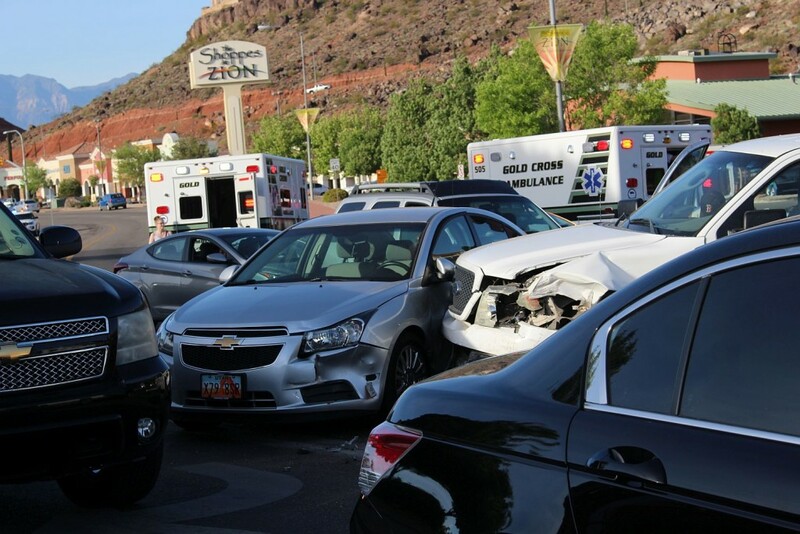 When officers arrived they found eight vehicles had collided, injuring occupants and causing extensive damages, St. George Police Lt. Joseph Hartman said. 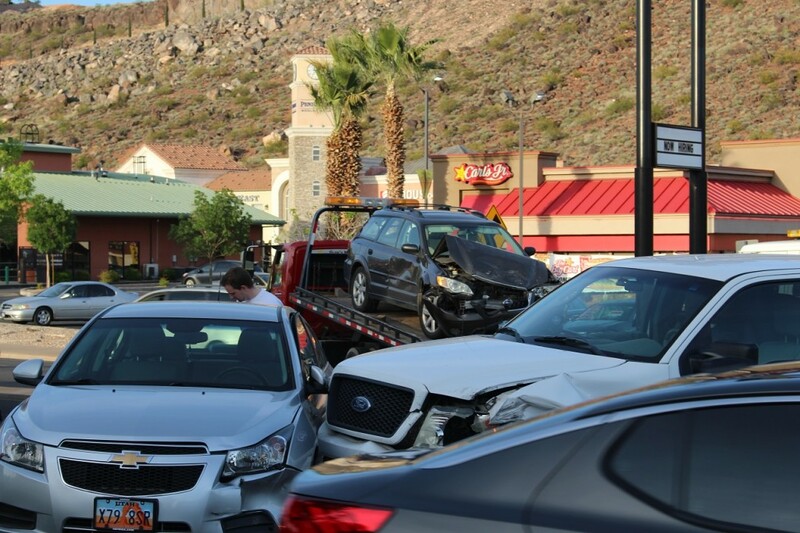 As emergency personnel tended to the scene, two injured drivers were quickly transported to Dixie Regional Medical Center while others were treated at the crash site. Hartman said a preliminary investigation determined a man driving a white Ford pickup truck ran a red light as he approached the intersection of East St. George Boulevard and North River Road, causing the collision involving multiple vehicles. The driver of the Ford pickup swerved as he ran the light, striking two vehicles stopped in the left hand turn lane on St. George Boulevard. 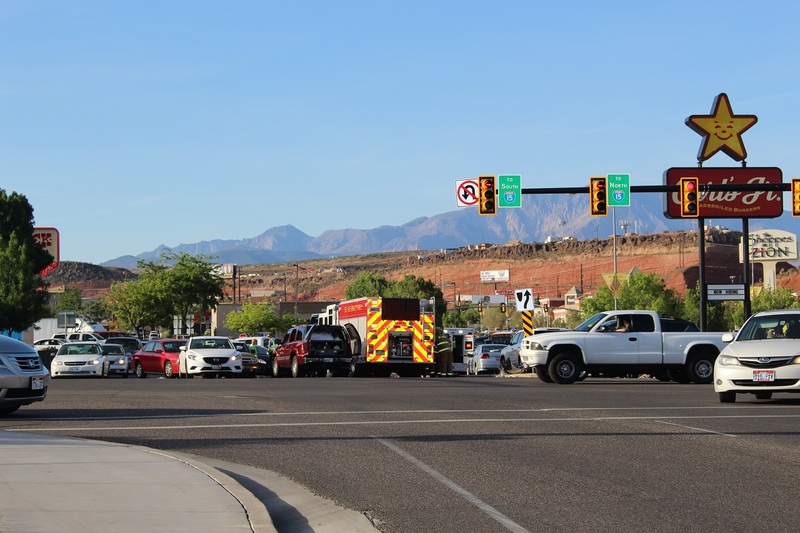 The impact sent both vehicles waiting in the left turn lane spinning into the intersection while the Ford truck behind them jumped the median, which launched it into the southbound lane of North River Road. Vehicles stopped at the light in the southbound lane of North River Road were then struck by the Ford truck. 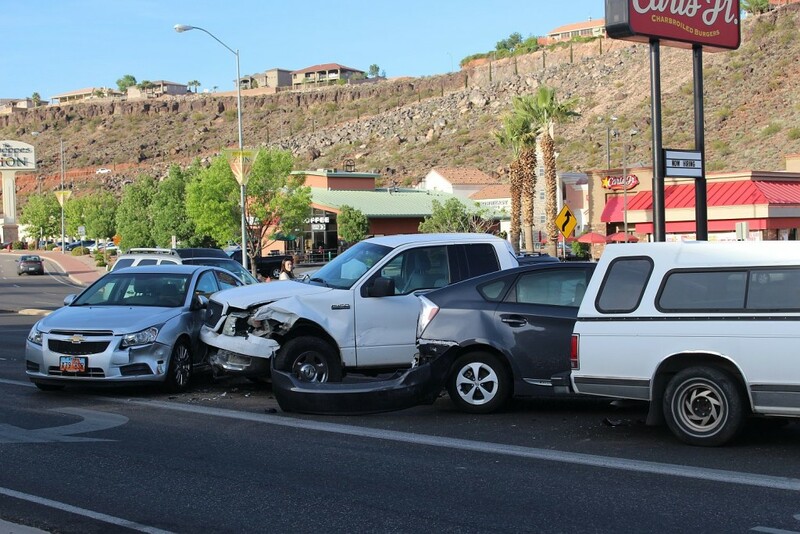 After striking the first vehicles in the southbound lane of North River Road, a domino effect of impacts followed until a total of eight vehicles were involved in the multi-car collision, Hartman said. 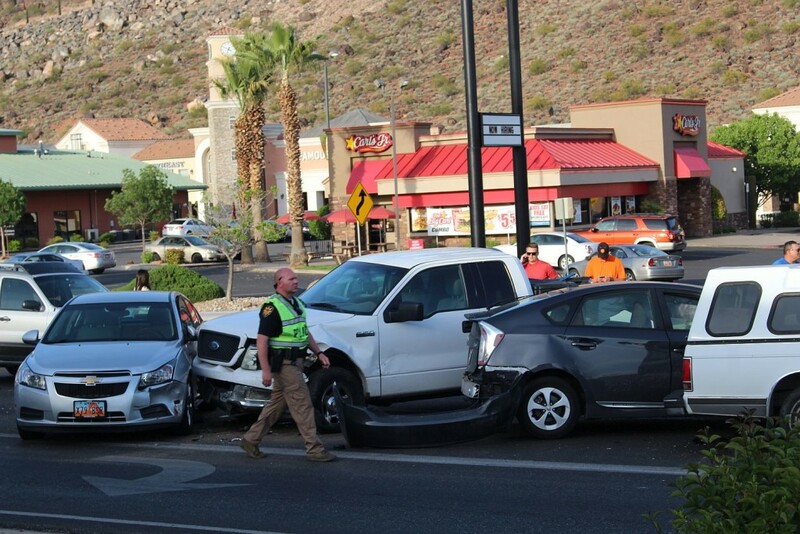 Vehicles involved in the crash include the white Ford pickup truck, a Subaru station wagon, a black Toyota Prius, a white Chevrolet pickup truck, a silver Ford Escape, a copper Honda two-door sedan, a silver Chevrolet four-door, and a silver four-door sedan. 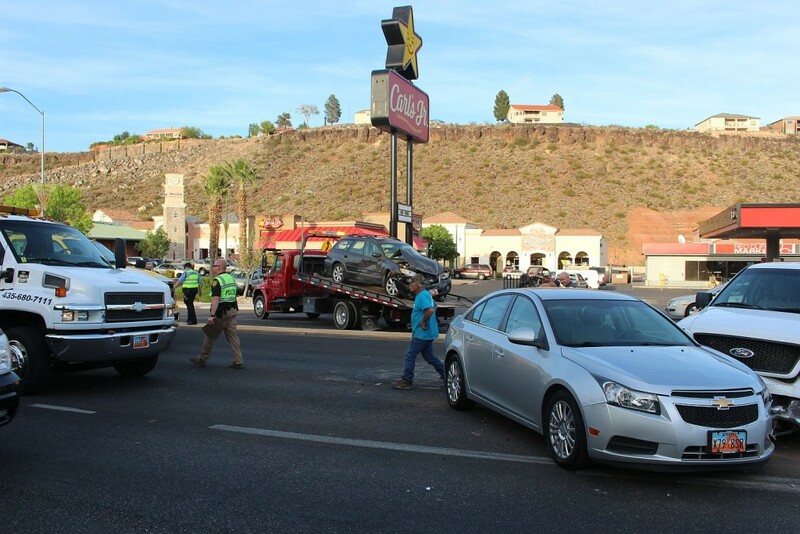 Five of the vehicles appeared to sustain minimal damage and were driven from the intersection. 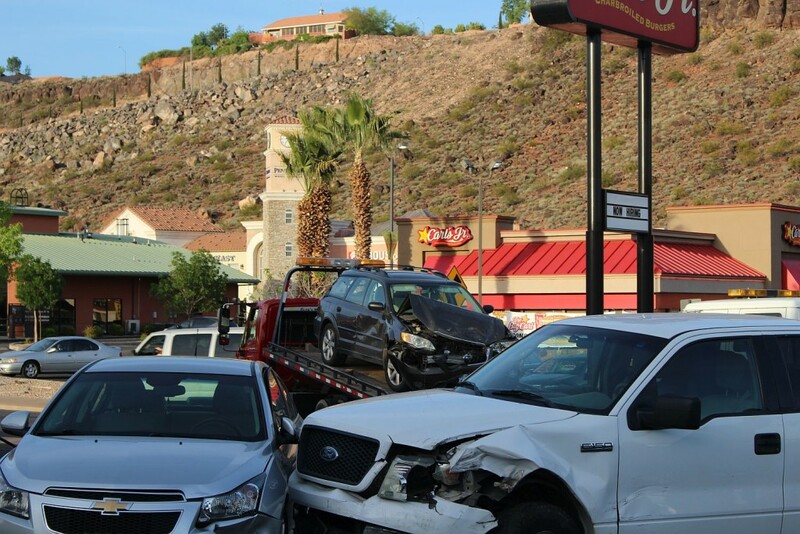 Three vehicles sustained extensive damage and required towing, including the Ford pickup truck which was impounded after police arrested the driver for suspected DUI after he allegedly failed a field sobriety test. Due to the number of vehicles and emergency personnel involved, traffic was affected for over an hour as responders tended to the scene. No additional information was made available at the time of this report, but more information will be made available as the investigation continues, Hartman said. 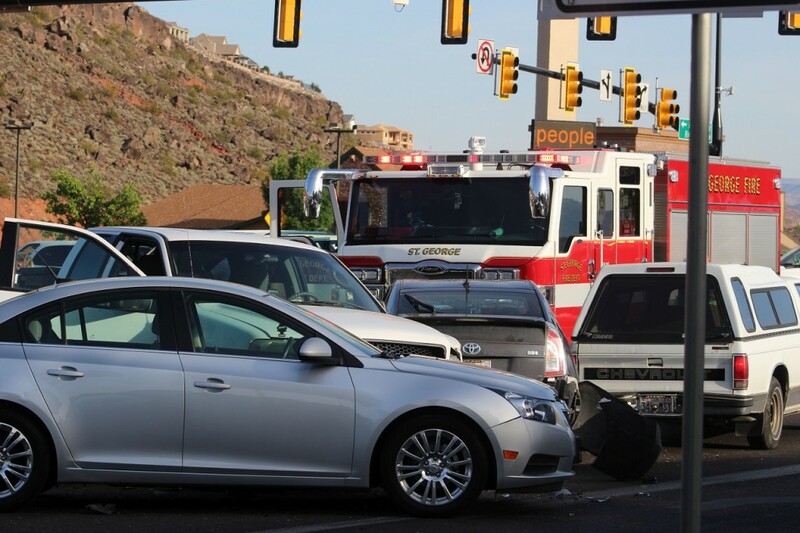 St. George Police Department, St. George Fire Department, Gold Cross Ambulance, and the Utah Department of Transportation Incident Management Team responded to the accident. Start writing citations for this drunk driver: running a red light, failure to maintain control of a moving vehicle, failure to stop, failure to maintain vehicle in his lane, failure to be a good citizen, failure at being an alcoholic, failure to make good choices, and failure to maintain self control. “failure at being an alcoholic” ?? Wouldn’t that be called “Being Sober” ?? He was too drunk to use his ‘Get Out Of Jail Free’ card- claiming a medical incident. Dui is bad enough, st George sure has an overcrowding problem with their roads… They gotta go up with their roads and stop tearing out businesses and parking areas… They are going to have to start new plazas and just wait… They need to focus on affordable businesses bc, they keep looking at revenue from high dollar stores to fund everything and the Blvd keeps staying packed bc st. George still needs affordable business space… More access to small businesses… I think a Large Simon outdoor mall like in Orlando for small and large businesses is a good answer… Like Waterford towns mall Orlando… But, we still need thrift stores, bread stores, seamstress… Etc.. Need some overpasses and layered streets..
Make sure you publish the identity of this irresponsible criminal. The names of people who are arrested is public information. We should follow up and make sure this person is not released from jail. We don’t need him killing our loved ones. I been driving for 50 years and this city seems to have more than its share of red light runners. I believe it is time for red light cameras with very heavy fines. I have heard all the arguments against cameras and few have merit. It is time we get tough on this and other serious traffic violations including more unmarked police vehicles assigned specifcally to SERIOUS traffic violations. We also may wish to talk about annual driving tests for those over 65. I see your point, but would a red light camera have prevented this? I doubt it. It appears that the driver was drunk, passing through a very busy intersection. 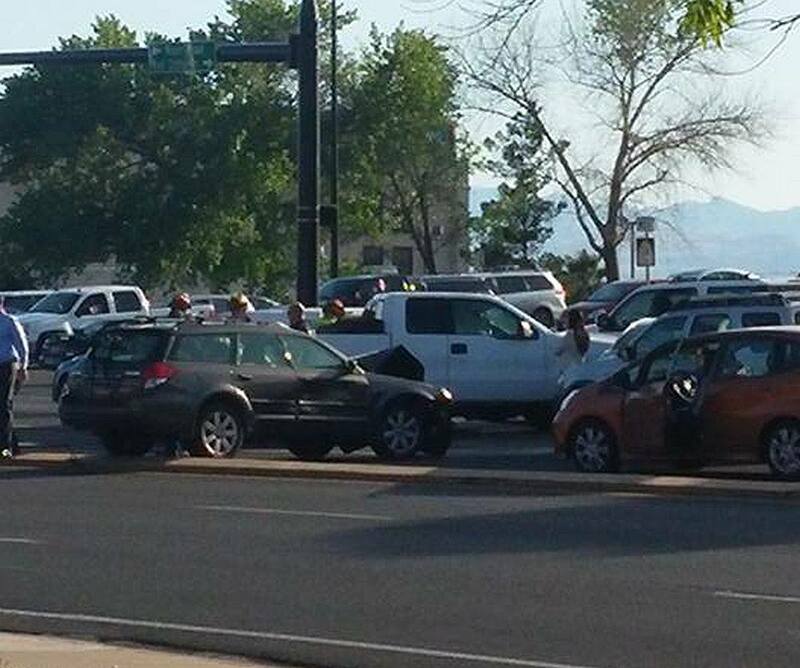 Maybe one of those super-effective “This Is A Red Light Running Free Zone” would have prevented this mass pileup. Maybe tape a “Drunk-Driving Free Zone” right above it. Just another Sovereign Citizen behind the wheel in St. George. Laws? I don’t have to obey any stinkin’ laws. We were waiting at the red light in the straight ahead lane and this idiot in the white pick-up hurtled past us going straight through the red turn signal. I glad but can’t believe that nobody died – I’m guessing that the car he hit first, who was making a left turn, had no passenger or that passenger would be dead, even with airbags. It was shocking to see how quickly it turned into an 8 car collision. I’m impressed 6 comments and nobody mentioned Mormons LOL !